This is one of the truly great herbs (a dish of well-made scrambled eggs lightly laced with tarragon is a Divine gift). It is a perennial hardy enough for outdoor growing hereabouts (it is listed as hardy to Zone 5, but Zone 4 growers find it overwinters reliably), but—sheerly for convenience—we think it better grown indoors anyway. While the scientific literature mentions some cultivars, no seedsman ever offers anything beyond the distiction between French tarragon and Russian tarragon. There seems some confusion as to whether Russian is a cultivar of Artemisia dracunculus or a separate species (A. dracunculoides), but it is more or less universally accepted that only French tarragon (often called “true tarragon”) is the only one of culinary value. But seedsmen’s catalogues act as if they are initiating you into The Secrets of the Ancients to even tell you that French and Russian tarragons are different things—sort of like saying “don’t mistake a daffodil for a rose”. Well, so be it. The only thing one has left to do is be absolutely, positively sure one is getting true French tarragon, not the vastly inferior Russian. (If you are ever offered “tarragon seed”, run away screaming, because it will be the dreadful Russian sort: French tarragon does not set seed and must be grown from cutttings. And though all tarragon offerings are generic, it still pays to buy it from a reputable herb specialist, who will likely have the hardiest strains and healthiest plants. 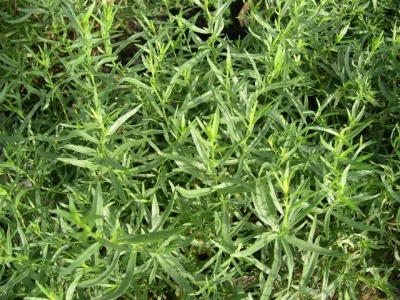 As noted above, French tarragon rarely if ever sets seed, and so must be grown from cuttings. The plant can eventually get large—up to 2 feet across—so it wants a good-sized pot if grown indoors, and that pot needs especially to be deep, because the one thing that will kill off tarragon readily is “wet feet”, to which it is very susceptible, so—in pot or in ground—its roots need plenty of room. For that same reason, the soil it is grown in needs to be pretty sandy, so as to have the best possible drainage: clay soils are a very bad thing for growing tarragon. (In containers, us a soil-less potting mix, which you can buy or make up yourself from the several recipes floating about the web: the crux is rapid drainage.) But the soil does not need, or even want, to be rich—for best leaf flavor, average fertility (or even less) is supposedly ideal. Tarragon absolutely detests dampness—at its roots or on its foliage—which will kill it quickly. Besides putting it in sandy soil over a thick gravel layer (or, if in pot, in a fast-draining soil-less potting mix) to begin with, keep the foliage well pruned, removing any dead or dying foliage at once and in general keeping the plant open to air movement, try to space it a little away from immediate contact with any other plant’s foliage, and do not wet the foliage when watering tarragon. And, of course, water tarragon very sparingly. Harvest tarragon as you need it, preferably literally—that is, when about to cook with it. Cut about a third of a branch, then chop the leaves quite fine, to fully release the flavoring oils. Tarragon makes an excellent flavored wine vinegar, and an excellent herb butter, alone or in combination with some other fines herbes. Although no one explicitly says so, it’s probably a good idea to renew tarragon every few years by starting a new cutting taken from a healthy plant. It was last modified on Tuesday, 5 February 2019, at 02:06 EST.